To satisfy high client demand we have a number of buyers ready to purchase and waiting for three, four and five bedroom homes in the Clarkston, Eaglesham, Giffnock, Newton Mearns and Whitecraigs areas. 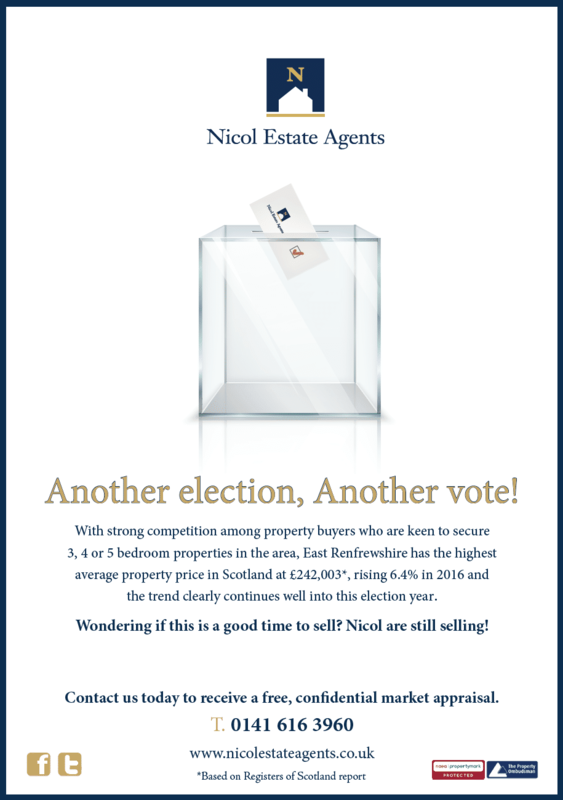 With strong competition among property buyers who are keen to secure 2, 3, 4 or 5 bedroom properties in the area, East Renfrewshire has the highest average property price in Scotland at £242,003*, rising 6.4% in 2016 and the trend clearly continues well into this election year. Moving home is not complicated but it can be daunting, as your home is one of the largest investments you will ever make. Although the Internet has the changed the world, buying and selling property is a very people oriented business and good communication is essential for a successful move. With over 90 years’ combined experience, an extensive qualified database of home buyers, proactive marketing and a proven track record of success, our knowledgeable and experienced sales team live locally and are available 7 days a week for help and advice. All our staff are dedicated to providing the highest level of service and attention throughout the entire moving and selling process. We offer a bespoke, personal and transparent approach, providing a clear commission structure with no hidden charges and we will always endeavour to achieve the best price for your property. At Nicol Estate Agents we value quality over quantity and there is no one-size fits all policy. We consider every home and every seller individually. Nicol Estate Agents focus solely on residential sales and are members of the National Association of Estate Agents and The Property Ombudsman. Simply put, we love what we do. We value the great relationships we have built with our clients over the years and the reputation we have gained for great customer service. So if you want an Estate Agent that puts you at the heart of their business, call our team today for a free, confidential no obligation market appraisal and full details of our bespoke service. So if you want an Estate Agent that puts you at the heart of their business, call our team today on 0141 616 3960.